"Each spring, you will watch the cherry trees bloom and grow. It has been our only tangible contribution to the college. It is our most earnest prayer that our friendship will continue to grow. At this time, we say, not goodbye, but until we meet again." The attack on Pearl Harbor on Dec. 7, 1941, forcibly launched the United States into the Second World War. Fear gripped the nation, and hysteria crept into the American psyche, spurring a decision by President Franklin D. Roosevelt to sign Executive Order 9066. The order gave military personnel the authority to conduct a mandatory evacuation and segregation of Japanese Americans from the West Coast. Each spring, you will watch the cherry trees bloom and grow. It has been our only tangible contribution to the college. It is our most earnest prayer that our friendship will continue to grow. At this time, we say, not goodbye, but until we meet again. 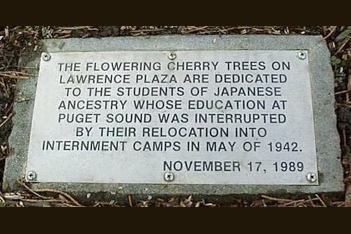 The cherry trees were initially planted in 1940 by the Japanese Students' Club. 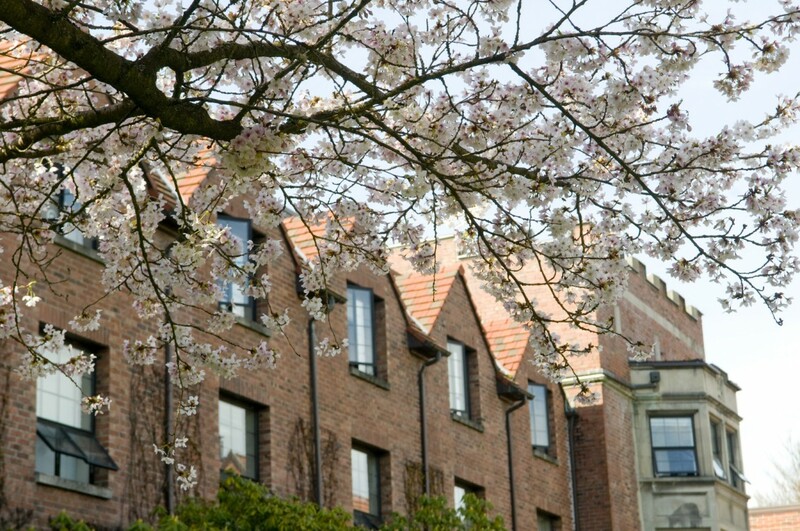 Today, the campus cherry trees represent much more than that simple act of friendship. 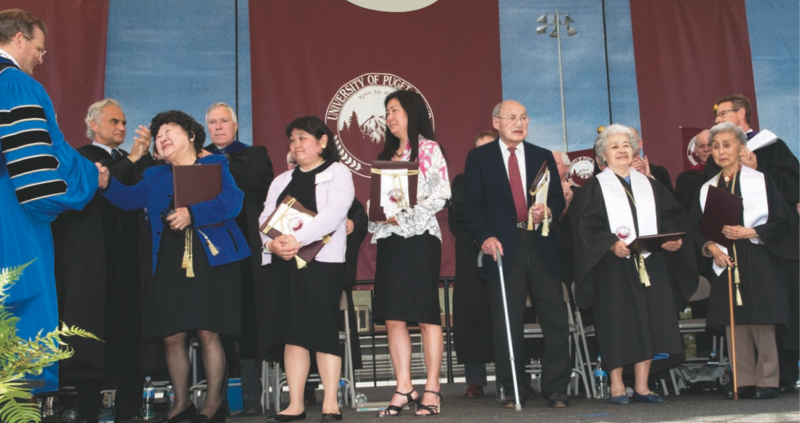 They are a living legacy that honors not just the 36 Puget Sound students incarcerated in the spring of 1942, but the thousands of Japanese Americans forced from their homes during the Second World War. 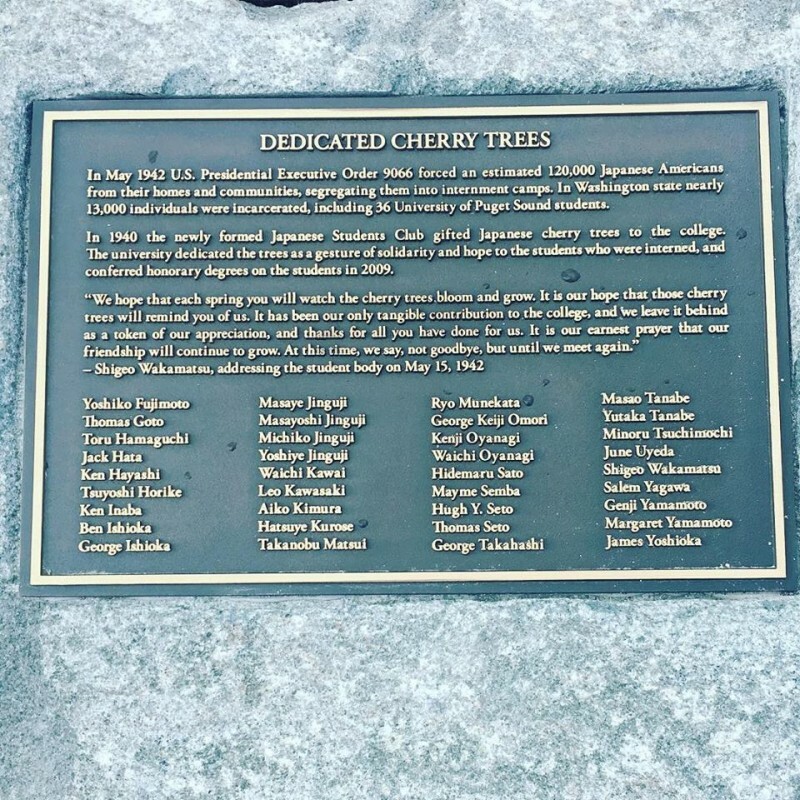 Each year we look to the delicate blossoms of the cherry tree as a tangible reminder of the fragile nature of freedom and our perennial hope for peace.